Now that’s what I call…camelflage. He looks fabulous! The coat is spectacular and i love just the hint of the white t-shirt. Great photo. Beautiful and cozy camel ensemble! Very elegant! Great shot! INSPIRATION!! This man has great taste. I have a Lauren Polo coat where the sleeves are an inch too short but a gorgeous and generous cut otherwise; I am very reluctant to get rid of it for that issue. I think I will wear it with the same panache as this gentleman. 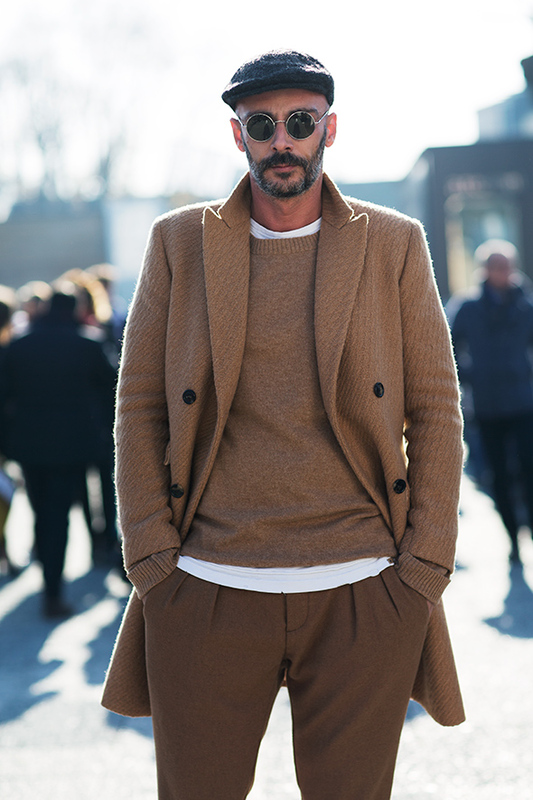 All camel tones and a devil-may-care attitude is the key. Hmmm. Oooomph. I’m so getting the Jean Reno vibe. The Professional? You bet. eh Jean Reno, est-ce vous? OMG-this is so perfect! Who is he? Ruslan: I think the style profile section of this blog somehow pointed in that direction. However, if I remember correctly, they were all people directly involved in the industry and not just people interestingly attired in the streets. I think both segments are worth listening and I agree with you that a little explanation sometimes would be cool. Quite sure Scott has lost some precious hours of sleep musing about these paradoxes and my guess is that he prefers the picture to speak for itself. Cheers. He looks wonderful. That pop of a crisp white tee underneath all that wool is just perfection. Me encanta la foto, y el contraluz creado. Que decir del look, me parece fantástico, una simple camiseta blanca y un jersey de cuello redondo. definitivamente ese hombre tiene estilo. It would have been nice to see his shoes. I wish some time I will take pictures as you..
Camel et une touche de blanc, waouhh! where can I get that gorgeous coat? The combination of materials as well as slight shift in the shades of his garments makes the whole look perfectly balanced and casual. Perfect shot.